The people born and raised in Madrid believe that it’s European equivalent of NYC. Surprised? Well, you’d better not ever try to argue with them about it! You’ll just get them worked up, they’ll start screaming and swinging their hands and won’t even let you explain yourself. Instead, while you’re in Madrid, imagine like being in (the European) NYC. The best part of Madrid is that you can find here whatever you’re looking for, even if you’re not sure what it is. An example? 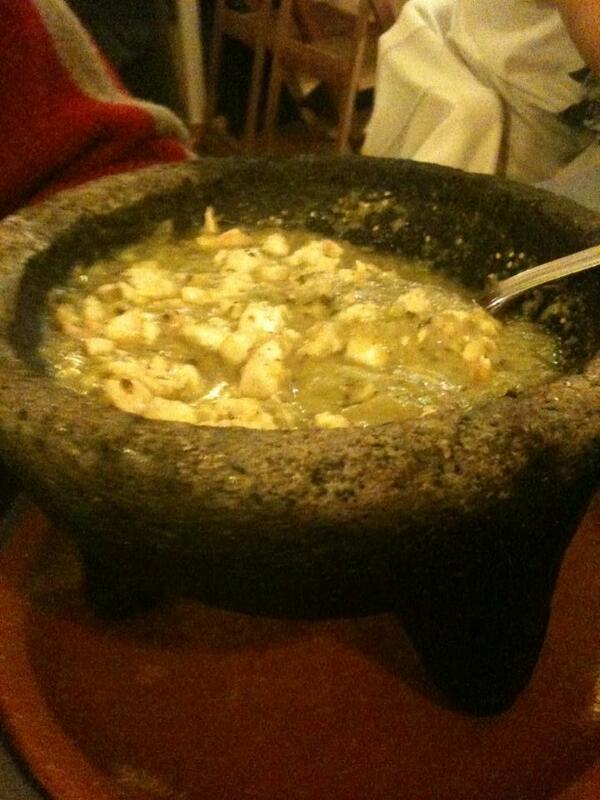 I spent 23 pointless years of my life without knowing that I am a huge fun of Mexican cuisine. Not every Tex-Mex snack you can get in quasi Latin bars, but the best spicy original homemade Mexican food. I was lucky enough to share my first Spanish apartment with a Mexican student that taught me everything (and I mean everything) one needs to know about their cuisine. That’s when I started to cut veggies into tiny tiny pieces. Actually, so tiny that you’d need a microscope to check if they’re actually there. I also promised to mix only 3 colors of veggies in one dish, white, red and green. If not, I’d let the other slap me in the face. That was some serious stuff! In my humble opinion, after one year of (hard) training, I am one of the few who really knows what it’s all about. When I started going out with my current boyfriend I wanted to prove him that I really can choose an authentic Mexican restaurant. I was searching and asking every Mexican person I knew about the best restaurant in town and finally I went with La Taquiería del Alamillo. I crossed resources with another group of friends and they approved the choice. I was so excited about the date I was about to enjoy, great fresh spicy food, nice colorful spot and excellent strong Margaritas! As a great organizer that I am I called to book a table for two; imagine my surprise when I heard that they were booked for the whole weekend and the weekend after as well. And the weekend after that everything was booked as well. I felt like some kind of loser who is not able to get in! I took my boyfriend with me at 7.30 pm on a Saturday night and we went to make a line in front of La Taquiería del Alamillo (they open at 8.30 pm). I thought that I was being very clever, that once they were opened we would sneak in and nobody would kick us out. Well, apparently there were 5 other clever people thinking the same! That’s insane, I thought. I feel like I am living in NY, I added. After 1 hour of waiting on a dark cold night they let us in and we actually get a table for two! Only one hour of waiting, yaaay me! I was already in a seventh heaven and I hadn’t even tried the food yet. The restaurant was rather small with 7 or 8 tables. The walls were full of flowery colorful cotton and wooden Mexican decorations. In each corner there were grey stony Aztec sculptures. Everything was tasteful and made you feel like you were in a little village of Yucatan. The first thing we ordered!! As my boyfriend knows less than nothing about Mexican cuisine I was in charge of choosing dishes for the dinner. And I did! For starters we ate the most crunchy yellow corn nachos with grilled cheese and freshly squashed avocado with lime juice. It felt like a piece of heaven in my mouth. 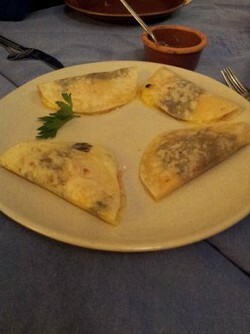 Then we had a small white Quesadilla with cheese and Huitlacoche. Sounds nice, doesn’t it? And it’s more that delicious; it tastes rather funny – bitter and sour at first and sweet at the end. You’d better never ever ask the waiter what Huitlacoche actually is, if you want to finish your dinner without throwing up. It’s a black corn fungus. I know, disgusting but still delicious for me! The main course was an art piece, served in a hot black stony bowl. It was a soft grilled chicken in a sauce made of green tomatoes with jalapeños and sweet onion. We ate it with yellow round corn flour tortillas. The flavor was spicy and sweet, acid and fruity at the same time. Amazing how Mexican chefs do magic with the food. After the dinner we ordered another big glass of claret Margaritas with a slice of lime, well two rounds of Margaritas. I am almost sure they were made of roselle (plus tequila) but I have to be honest here, I do not remember 😉 What I remember is that they were strong and delicious! P.S: I received no compensation for writing this post. I paid for the food (and it was worth it). Have you tried Takos Al Pastor by metro callao? You should give them a try. No I have not! I just checked the place on Tripadvisor and the food looks pretty good! Thanks for the tip!